The 2013 SCA Championship got off to an exciting start at the Border Bogie Challenge, with a new team and a novice driver taking maximum points for an early lead. Zara Lane drove the very impressive Woodworm cartie to an impressive third place overall, and pushed experienced racers Rich Thomas [Lola] and Steve Thomas [C12] very hard indeed. The current joint champion 'Where's Me Spanners' could hardly have got off to a worse start to their title defence and crashed heavily on the their second run in sight of the finish line. Driver Dom Quinn was unharmed, but the cartie had to retire and will need some repairs before the next race in the series at the Hawksland Hill Run on 7th July. Registration for the SCA Championship is free, and you can still register if you would like to join the fun. Just complete the online form and enter the events you want to compete in. Submitted by scottishcarties on May 27, 2013 - 14:46. The DVD of the 2011 SCA Championships is now available from our friends at AAL Media Scotland. 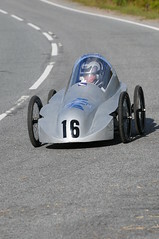 From planks of wood & Silver Cross wheels to the high tech aerodynamic carbon fibre 'creations'- reaching speeds of in excess of 70 mph at Cairngorm Soapbox Extreme - the longest and fastest gravity racing course in the UK - the ultimate test of driver and soapbox! This DVD features terrifying on-board runs, heart stopping thrills and spills, Competitor interviews, on-course footage, full results, extras and much much more ... Filmed and produced by award winning AAL Media Scotland. Submitted by scottishcarties on August 1, 2011 - 11:21. The second round of the SCA Championship took place in the lovely Borders village of Denholm, near Hawick last weekend. 24 teams - the largest field yet - took part in the senior race at Border Bogies, and the juniors were well represented too. After last year's race there was speculation as to whether it would be possible to complete the course in under a minute, and this year we didn't have to wait long for the answer. Team Rooket, in the second run of the day, smashed the 60 second barrier by 2 seconds. Their records didn't stand for long, however, and C12 posted a time of 56.45 seconds in their second run - a time which nobody could beat for the rest of the day. But that didn't stop everyone trying! C12, Team Alford, Team Rooket, Centa Bavaria and Pist n Broke all managed sub 60 second runs. Submitted by scottishcarties on May 23, 2011 - 12:37. 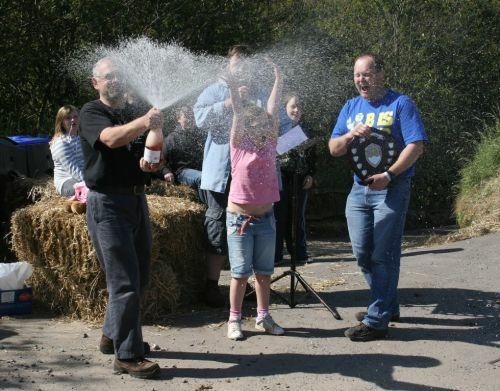 The Scottish cartie racing season will kick off in May with a brand new event at Castle Forbes, near Alford in Aberdeenshire. The Castle Forbes Gravity Race (7th & 8th May), set in the grounds of the castle itself, promises to be very challenging and it will be interesting to see which carties do well there. Can last year's SCA Champion, Team Alford (right), make use of home advantage to start the season with another win, or will one of the many new teams steal their thunder? Just two weeks after Castle Forbes is the fabulous Border Bogie Challenge (21st May) in Denholm, and then the following month it is back up to Aberdeenshire for the short but intense Catterline Cartie Challenge (12th June), which will be test drivers and their carties to the limit. Any carties still left in raceworthy condition will then get to race alongside the best teams in the UK at Cairngorm Soapbox Extreme (1st & 2nd July) - the longest and fastest soapbox race in the country. Alongside all this we'll be running the SCA Championship again. If you're taking part in two or more of these races, why not take your chances and register for the championship too (note - if you've already got a place at Cairngorm you've automatically been registered in the SCA Championship too). Submitted by scottishcarties on January 22, 2011 - 01:26.